One of things I have always wanted to do was to capture the joy of sailing - not least to try and explain to others why I was so fanatical about it. Photographs don't really capture the excitement, or the noise, associated with sailing. So video was the only real solution. However whenever I saw coverage of yacht racing there was usually very little coverage of the actual racing. Video cameras were so large and bulky that it was not really feasible to have them on board large yachts, let alone dinghies. Only recently have camcorders started to reduce in size and price. A few years ago a hand held camcorder would cost a fortune, and have a number of practical limitations. The battery life was pretty poor, and tapes could only capture a limited amount of footage. This year, 2007, saw the introduction of serious HDD (hard disk drive) cameras for a reasonable price, which could give good quality film. There are a few HD (high definition) camcorders around, but I thought that I would start with the best I could find with normal definition. The biggest feature of HDD camcorders is the sheer size of recording time. On normal mode you can get about 24 hours. In high quality mode it is still 9 hours. For amateur video it is difficult to image when you would need more than that. The other feature that appeared on the market in 2007 was long life batteries for camcorders. Sony introduced their STAMINA battery, which apparently offers up to 6 hours recording. So we took the plunge. We bought a Sony HDD DCR-SR290. It is smaller than you would imagine, and a nice weight for day to day use. So far we have not tested all the functions, but it seems to work well. The nighshot function is a bit of fun, used to capture exhausted children after drama shows, with Big Brother type video diary entries. But the real purpose of the camcorder is to take it on the boat. And having spent over 500 pounds on it, I was not keen to have it exposed to salty spray and rain. So we invested in the Sony Sportpack - the SPK-HCC version. After testing in the bath, I can confirm it really is waterproof! The last challenge was to find a way of getting video footage. 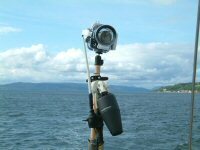 Have you tried getting decent film when the boat is heeling and pitching? The film tends to be quite shaky and wobbly. So having seen the HorizonTrue ptoduct (horizontrue.com) I decided to make my own. With a stanchion fitting, a big bolt, some drilling and cursing the level horizon video camera mount was created. Initial tests suggest that it will work, although it is mounted a little high. The idea is that it stays level, compensating to heel, but not for pitching. Over the summer I hope to test it lower down, and possibly at the front of the boat. The site will host the best footage - watch this space.